Seven trainees from Thailand started their 4-week long training at Indian Institute of Surveying and Mapping (IISM) of Survey of India here on Monday as part of Indo-Thai Geo Spatial Cooperation Project. 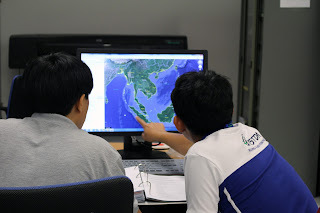 The trainees are from Geo informatics & Space Technology Development Agency (GISTDA), Thailand. The cooperation project seeks to share and demonstrate capabilities and expertise gained by the Survey of India in Urban Mapping by undertaking survey of a chosen town of area about 100 sq km, in Thailand and for imparting training in surveying and mapping techniques officials of GISTDA at the Indian Institute of Surveying and Mapping (IISM). In year 2013 a memorandum of understanding was signed during the visit of the Prime Minister of India to the Thailand between Royal Kingdom of Thailand and Government of India, which envisages cooperation between the two countries in the field of Science, Technology and Education. Department of Science & Technology, Government of India is monitoring this joint project on behalf of Government of India. Joint Secretary, DST is the nodal officer for the implementation of the project. To implement the objectives envisaged in the MOU, a group of officers accompanied with their Managers from the Kingdom of Thailand had visited Indian Institute of Surveying & Mapping, Hyderabad (Survey of India). Survey of India & DST Officers also visited Thailand to firm up the further modalities and terms of the cooperation. During this one month they will be taking training in different specialization of surveying and mapping like Photogrammetry, Geodesy and Topographical mapping. After the training they will use the knowledge gained during the training for various types of mapping including the urban mapping in that land. llSM was established in 1967, is pioneer institute in lndia in field of training in Surveying and Mapping and has already trained more than 30000 lndian personnel at various levels and more than 600 Jrom other Asian-African country in field of Survey and Mapping. Officers and Personnel from almost all state government came regularly to llSM. SOl, the India premier national mapping agency, is serving the country for nearly past 250 years by generating and providing the quality geospatial data and map to the country. Shri R. M. Tripathi, Surveyor General of India, Shri U.N Gurjar, Addl Surveyor General, Shri U.N. Mishra, Deputy Surveyor General and Course Co-ordinator Shri S.V. Singh and Shri Tatiya Chuentragun, Director Product Development, GISTDA, Ms.Varaiporn Sintop, Co-ordinator, GISTDA from the Government of Thailand were present at the inaugural of the training programme.